There’s an old joke — “for God so loved the world, He did not send a committee”. But in Athens, GA, there’s a committee that’s been quietly building, renovating, and repairing homes for low-income neighbors since the early ’90s. They’re called the “Committee of 1000” and they support the mission of their local Habitat for Humanity. Clarke County has one of the greatest needs for low-cost housing in the USA. Clarke County, GA, has one of the widest wealth gaps of any county in the United States, regularly placing in the top 20. 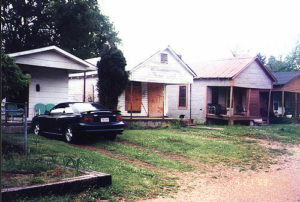 Even in the period from 1980 to 2000 when poverty rates in the US and in Georgia were declining, the poverty rate in Clarke County rose to nearly 30%, the fifth highest in the nation, with 1 in 4 children living in poverty, earning Clarke an Economic Research Service “housing-stress” county designation. The housing crash of 2008 and ensuing recession only made the problem worse, as many full-time benefitted jobs which had been lost were replaced during the recovery with part-time unbenefitted positions or with unstable freelance “gig work.” As of 2014, the top 5% of Clarke residents owned 62% of the wealth, while the bottom 60% held just 4% of the wealth. The current poverty rate in Clarke County is 35%. The home ownership rate in Clarke is a mere 39%, compared to the national rate of 64%. Median home value is $152,300, which places the minimum recommended household income for average buyers at $45,690, yet median household income in Clarke is $33,116. 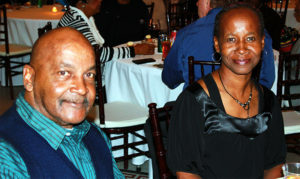 Athens Area Habitat is entirely dedicated to providing decent, affordable housing in the Athens, GA, area. Who are the Committee of 1000? Last year’s 2017-18 committee, in fact, helped provide housing for two families, as their donations together with contributions from Thrivent Financial paid to renovate homes on Dublin Street in Athens’ east side and on Hawthorne Extension in the west side of town. The Dublin Street home was completed last summer and already has a family moved in, while the the home on Hawthorne Extension will be dedicated in a key-handover ceremony later this month. Every January, members of the Committee of 1000 gather with Athens Area Habitat board members, staff, and volunteers at a sponsor-funded gala to celebrate the past year’s work and hear what’s planned for the year to come. 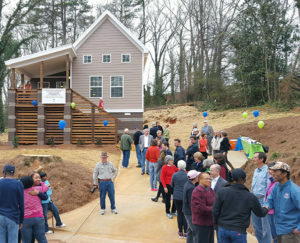 In the spring of 2018, Athens Habitat teamed up with SK Collaborative and the US Green Building Council of Georgia to sponsor a “Kinda Tiny Homes” design contest for highly efficient houses with floorplans under 800 square feet. Two winning design teams were announced in May and their concepts are slated to come online in 2019 as four “kinda tiny” homes are constructed in an existing Habitat neighborhood in Clarke County. The construction will be funded by the 2018-19 Committee of 1000 in partnership with the USGBC of Georgia. This project has stimulated much-needed discussion of progressive housing options in Athens-Clarke County and hopefully will act as a spearhead to stimulate updates to our local standards to provide for more cost-effective housing. 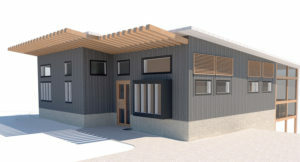 Current building and zoning codes often prohibit the construction of both traditional and emerging affordable home solutions such as “tiny homes” (around 400 square feet) and accessory dwellings, also known affectionately as “mother-in-law houses” or “granny flats.” The “Kinda Tiny Home” project, focusing on houses with 600-800 square feet of living area, is intended to provide a model for interim solutions to our affordable housing crisis and pave the way for re-assessment of existing barriers to affordable homes by local government and other stakeholders. 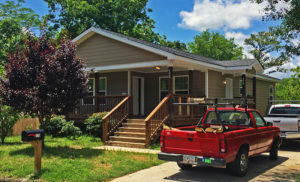 Studies across the United States and here in Georgia demonstrate that Habitat housing improves not only the finances of homeowners, but also their health and their educational and employment opportunities. By joining the Committee of 1000 today, you not only make an investment directly into your own community — one which will have an impact for many years to come — but this year you will also become part of a groundbreaking project that has the potential to open up more housing opportunities for everyone who lives in our area, not just Habitat homeowners. Joining the Committee of 1000 is easy — just click on the “Donate Now” button below and contribute $80 or more to the Athens Area Habitat mission. You’ll automatically become a member of the Committee, and will receive an invitation to our annual gala in January (exact date TBA). And you’ll have the satisfaction of knowing that your donation will help families and individuals right here at home. Thanks in advance for your support.